George Houston RSA (1869-1957) was born at West Lynn, Dalry, Ayrshire. He lived most of his life around Ayrshire, Edinburgh and Argyll, although he was widely travelled for his time, visiting Japan in 1911. 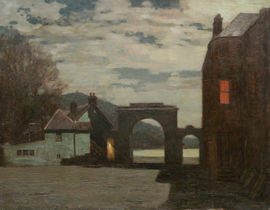 He is best known for his consistently high technical skill, capturing the atmosphere and changing climate and seasons of his favourite Argyll and Ayrshire. He painted mainly in oil and watercolour but also produced etchings. Member of The London Society of 25. Elected Associate Royal Scottish academy 1900. RSW 1908, Royal Institute 1920 and Royal Scottish Academy 1925. 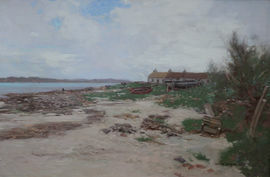 Exhibited in Australia, Canada, New Zealand, Europe and the USA. 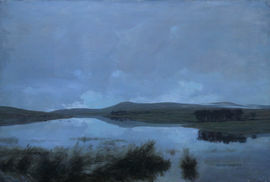 Represented in Glasgow Art Gallery (9) and other Scottish galleries.